In his best-selling book, The Passion Plan, Richard Chang showed individuals how to discover their passion and turn it into personal and professional fulfillment. 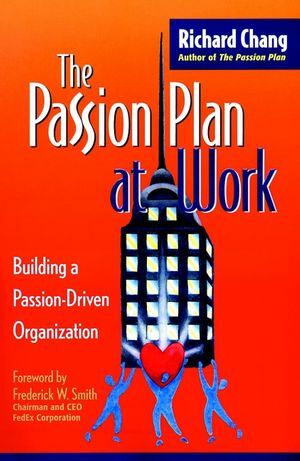 Now, in The Passion Plan at Work he shows how to bring passion into the workplace--and turn good companies into great ones. Adapting his seven-step model for individuals to an organizational perspective, Chang explains how passion can provide direction and improve performance at all levels of a company. Carefully leading readers through his do-it-yourself process, Chang provides specific guidelines for creating an action plan that galvanizes an organization around passion. Along the way he provides practical tools--questionnaires, worksheets, and checklists--to help assess an organization's Passion Profile and make passion a big part of your company's ongoing success. RICHARD CHANG is CEO of Richard Chang Associates, Inc., a performance-improvement consulting, training, and publishing firm headquartered in Irvine, California. He is internationally recognized for his strategic planning, performance measurement, quality improvement, organization development, change management, product realization, customer service, and human resource development expertise. Chang has consulted to a wide range of organizations--including Toshiba, Marriott, Nabisco, Universal Studios, Citibank, Nortel Networks, Fidelity Investments, and McDonalds. He has served as chair of the board for the American Society for Training and Development and as a judge for the prestigious Malcolm Baldrige National Quality Award in the U.S. Chang is the author or coauthor of more than twenty books on business and personal development, including The Passion Plan (Jossey-Bass, 1999) and Performance Scorecards (Jossey-Bass, 2000). Introduction: Bringing Passion into the Organization. Why Passion Works in Organizations: A Timeless Source for TimelyChange. From Passion to Profit: A Model for Organizational Success. Step 1: Start from the Heart: Passion as the Foundation of theOrganization. Step 2: Discovering Your Passion: Uncovering the Forces That WillDrive the Organization's Success. Step 3: Clarify Your Purpose: Channeling Organizational Passiontoward a Specific End. Step 4: Define Your Action Plan: Planning for Passion-InspiredChange and Growth in the Organization. Step 5: Perform with Passion: Translating Passion into Performancein the Office and the Marketplace. Step 6: Spread Your Excitement: Sparking Commitment and Enthusiasmin Employees and Customers. Step 7: Stay the Course: Keeping the Organization Centered onPassion. Profit with a Capital "P": New Definitions for a New Millennium.